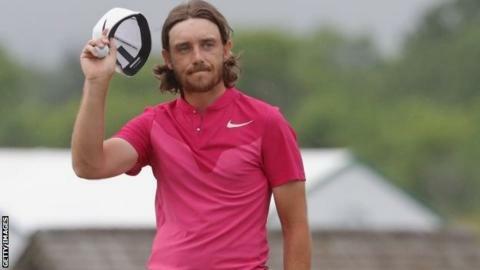 England's Tommy Fleetwood is one shot off Brian Harman's lead going into Sunday's final round of the US Open. Rickie Fowler, who led after round one, had a run of three successive birdies from the 14th as he shot a four-under 68 to get to 10 under and just two off the lead. South Korea's 21-year-old Kim Si-woo, who became the youngest winner of the Players Championship in May, also shot a 68 and is one further back. Masters champion Sergio Garcia is in a group of nine players on four under after he posted a one-under 71. There had been four other 63s in US Open history before this week. Jonny Miller hit the first on the par-71 Oakmont in 1973, while Jack Nicklaus and Tom Weiskopf's efforts came on the par-70 Baltusrol in 1980. Fiji's Vijay Singh also recorded a seven-under 63, at Olympia Fields in 2003. Thomas opened his round with two birdies before dropping a shot on the fourth. Four more birdies followed on the front nine before another bogey on the 10th looked to have put paid to his chances of breaking Miller's 44-year-old record. Southport's Fleetwood, who finished tied for 27th on his only other US Open appearance in 2015, appeared to be heading towards his second bogey-free round of the tournament after laying up with his second shot on the par-five 18th. However, he left his chip short and then putted through the green and off it with his fourth shot. A sublime floated wedge to three feet allowed him to escape with only his third bogey of the week. "That was the best shot I hit all day," the 26-year-old told BBC Sport. "I hadn't been out of position all day and suddenly I was staring double bogey in the face. "Bad shots make bogeys and 18 was a good example. I could still have been there now, hitting the ball over the green. But I hit the perfect shot and I was made up when I got on the green. "Three days down and so far so good." He said he had "pictured winning the US Open a lot of times before". He added: I felt really good, played really well. If I wake up with the same feelings on Sunday I'm going to have a chance." Fellow Englishman Casey was one of the four overnight leaders but he fared the worst, posting a triple bogey for the second day running as he dropped out of contention. His downfall began with an errant second shot on the par-four third into deep rough. That led to a penalty drop and a seven and a further shot went on the next hole. On Friday, the 39-year-old responded to a similar situation with a run of five successive birdies but he was unable to replicate that on Saturday, as he ended the round on four under par. Home players occupy 12 of the top 16 places on the leaderboard and with six shots separating them, any one could still win on Sunday. None of the dozen have won a major, and neither have the four non-Americans (Fleetwood, Kim Si-woo, Bernd Wiesberger and Hideki Matsuyama). Harman, who is bidding to become the first left-hander to win the US Open, knocked in six birdies. The 30-year-old, who won the Wells Fargo tournament last month, said: "I've been striking the ball so well and giving myself chances so I'll just try to keep doing what I've been doing. "I'll definitely think about the mindset I had in winning Wells Fargo a few weeks ago." Big-hitting Koepka, who averaged 320 yards with his driver on Saturday, had five birdies in his four-under round. Patrick Reed's seven-under 65 featured eight birdies and one bogey as he improved to eight under. He said he felt like he "hit the ball better" in Friday's second round, despite taking 10 fewer strokes on Saturday. Reed explained: "I was really seeing the lines and had the speed. And most of my birdie putts were uphill and I could attack. On Friday it was the opposite." Russell Henley (67) and Charley Hoffman (68) are all in a group four off the lead on eight under. However, not all Americans fared well. Jordan Spieth, the 2015 champion, started the day level par and was still on that mark after a couple of birdies cancelled out two bogeys in his opening 11 holes. "It's been an off-week for me with the putting," said the former world number one. "I've been striking the ball well. "It's just been trying to figure it out on and around the greens. And I feel like once the can gets open, I'll start pouring them in." Germany's Martin Kaymer, winner in 2014, took 41 shots to complete the front nine and although he picked up two birdies on the back nine, his three-over 75 saw him drop back to level par. And two-time winner Ernie Els, who was two under at the halfway stage, dropped five shots in his opening six holes on Saturday. The South African rallied with an eagle two on the par-four 15th but had a triple-bogey seven on the 17th to drop to five over after a 79. England's Eddie Pepperell, 26, had five birdies and two bogeys in his three-under-par 69 to get to four under and remain in with a chance. And Scotland's Martin Laird is putting together a solid tournament. He birdied the 18th, his 10th of the week to go with nine bogeys in his opening three rounds. However, it looks like Lee Westwood's wait to win a major will go on to The Open in July. The Englishman was three under after round one, but he followed Friday's 75 with another 75 on Saturday to drop to three over.